Inspired by the new Ben and Jerry’s ice cream flavor by Jimmy Fallon, my new Marshmallow Moon Cake will make you think you’re biting into the classic junk food treat, a Moon Pie. I’ve had this cake on my mind for the last few weeks – as soon as I saw Ben and Jerry’s made a new ice cream flavor with Jimmy Fallon. After making The Tonight Show Cake last year, based off Ben and Jerry’s Tonight Dough ice cream, I’ve been eager to make another cake inspired by another one of their ice cream flavors. It was so fun for me to take all the flavors in The Tonight Dough ice cream and figure out how to put them into a cake. It turned out to be one of my favorite cakes yet! When I saw the new Marshmallow Moon flavor that Jimmy Fallon helped create, I knew this had to be my next cake. The ice cream flavor, which is inspired by a Moon Pie, is made up of vanilla ice cream, marshmallow and graham cracker swirls, and chocolate chunks. 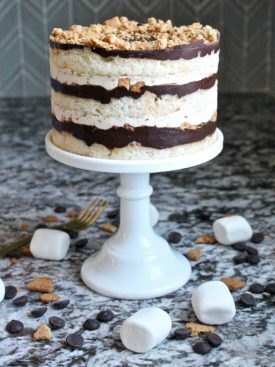 When I started thinking about how I would turn these flavors into a cake, I couldn’t help but feel concerned that it was too similar to my Ultimate S’mores Cake, which is made of chocolate cake baked on top of a graham cracker crust, filled with toasted marshmallow filling and chocolate ganache, and covered with chocolate buttercream. But the more I thought about it, the more I knew I could make this unique and it would have to start with the cake layers. 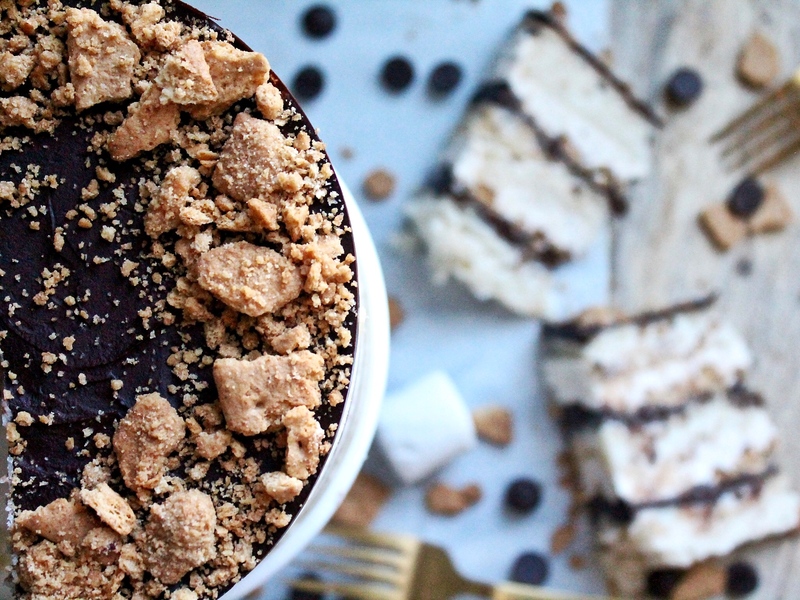 In my S’mores Cake, the cake was chocolate. For this cake, I wanted the cake layers to represent the vanilla ice cream. They needed to be tender and fluffy and have a strong vanilla flavor. To get the right vanilla flavor, I decided to use vanilla bean paste. 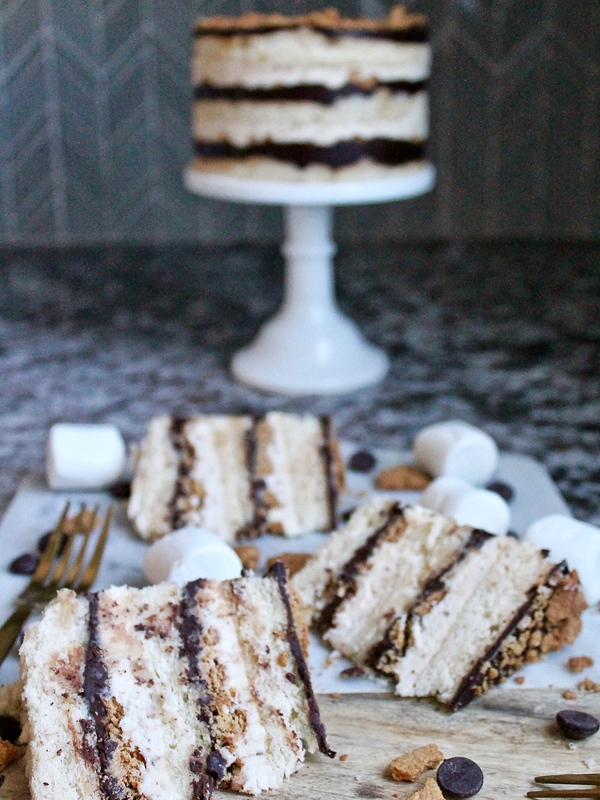 I also wanted more texture with the graham crackers than I had in my S’mores Cake. Instead of baking a graham cracker crust, I toasted graham cracker pieces tossed in a butter and brown sugar mixture. Good luck trying not to snack on them before you actually put the cake together. 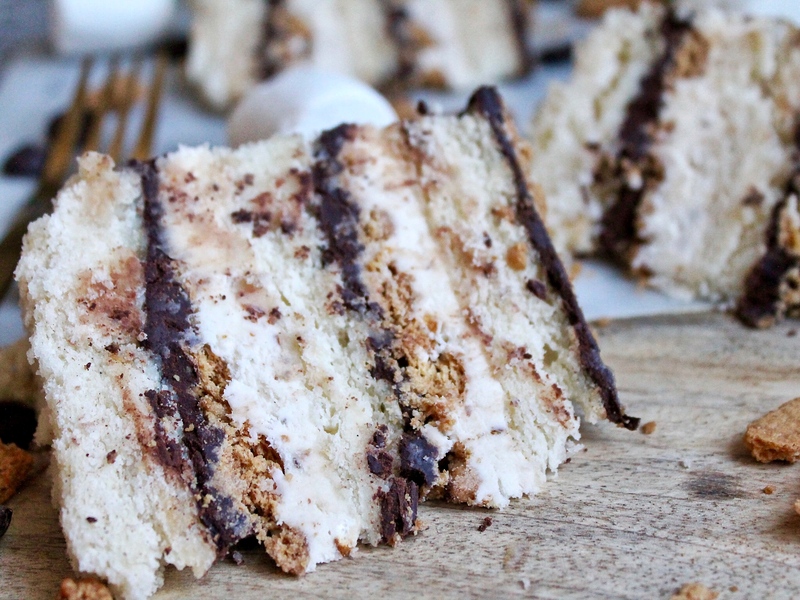 For the marshmallow aspect, using the toasted marshmallow filling from my S’mores Cake was a no brainer. It’s just too good. There’s no reason to reinvent it. And like a traditional Moon Pie, which is covered with a thin layer of chocolate, I spread a thin layer of chocolate ganache between each layer of cake and on top. Taking a bite of all these flavors and textures together will hopefully remind you of biting into a Moon Pie. 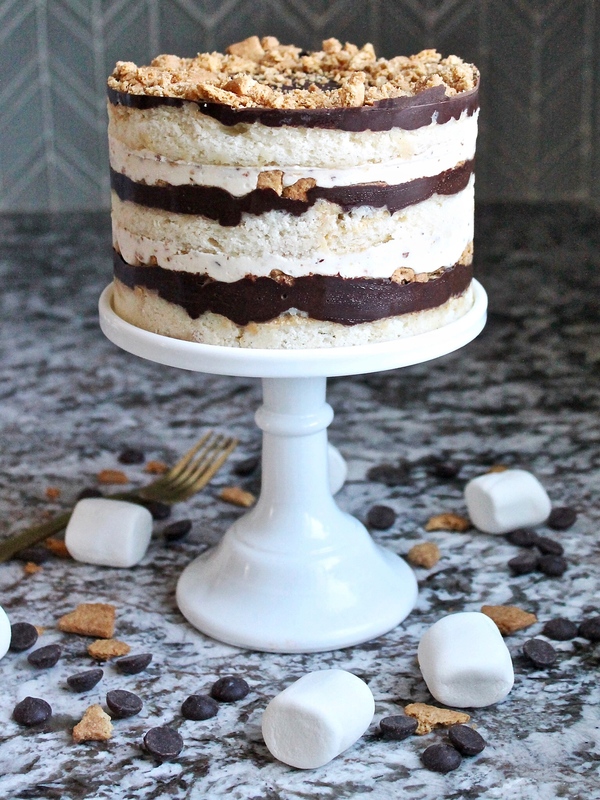 Inspired by the classic Moon Pie and the new Ben and Jerry's Marshmallow Moon ice cream flavor, this cake is made up of vanilla cake layers, toasted graham cracker pieces, toasted marshmallow filling and chocolate ganache. Preheat the oven to 350 degrees F. Prepare one quarter sheet pan with non-stick spray, parchment paper, and another coat of non-sick spray. Set aside. In the bowl of a stand mixer, fitted with the paddle attachment, beat the butter, canola oil, salt and sugar on high until fluffy and smooth, about 5 minutes. Turn the mixer on low and add half of the flour mixture to the butter mixture until fully incorporated. Then add all of the sour cream and blend well, and lastly, add the remaining flour mixture and mix until incorporated. Add the vanilla bean paste and beat on low until incorporated, only about 10 to 20 seconds. Scrape down the sides of the bowl and mix on low for another 10 to 20 seconds. Pour the cake batter in the quarter sheet pan and bake about 23-25 minutes or until a toothpick inserted into the middle of the cake comes out clean or with just a few crumbs. Make sure not to over bake. Remove cake from the oven and let cool in the pan for 10 minutes before inverting onto cooling racks. Once cooled, put a piece of parchment or a silpat on the counter. Invert the cake onto it and peel off the parchment or silpat from the bottom of the cake. Use the cake ring to stamp out 2 circles from the cake. These two full circles will be your top 2 cake layers. The remaining cake “scraps” will come together to make the bottom layer of the cake. Preheat the oven to 350 degrees. Line a baking sheet with parchment paper. Set aside. Place the crackers in a gallon sized zip-lock bag and crush them into pieces using a rolling pin. Set aside. Melt the butter and mix in the brown sugar. Stir until combined. Pour the butter and brown sugar mixture over the graham cracker pieces in the zip-lock bag and shake to coat. Bake the graham cracker pieces for 1o minutes. Let cool completely before using in the cake. Store in an airtight container until ready to use. Line a baking sheet with parchment paper and spray with nonstick cooking spray. Place the marshmallows on the cookie sheet. Place on the middle rack of the oven, and broil the marshmallows until golden brown on top, about 30-60 seconds. Keep your eye on them! In a microwave safe container, heat the cream for about 30 to 60 seconds. Pour the cream over the chocolate chips and let sit for 5 minutes. Stir the cream and chocolate until smooth and silky. For the first layer, clean the cake ring and place it in the center of a sheet pan lined with clean parchment. Line the cake ring with one strip of acetate. Place the cake scraps together inside the ring and use the back of your hand to tamp the scraps together into a flat even layer. Use the back of a spoon to spread one-third of the chocolate ganache in an even layer over the cake. Sprinkle about 1/2 to 1 cup graham cracker crumbs evenly over the ganache. Use the back of your hand to anchor them in place. Use a piping bag to pipe about 1 cup of the toasted marshmallow filling on the graham crackers. For the second layer, gently tuck the second strip of acetate between the cake ring and the top ¼ inch of the first strip of acetate, so that you have a clear ring of acetate 5 to 6 inches tall – high enough to support the height of the finished cake. Set a cake round on top of the marshmallow filling, and repeat the process for layer 1 (if 1 of your 2 cake rounds is jankier than the other, use it here in the middle and save the prettier one for the top). 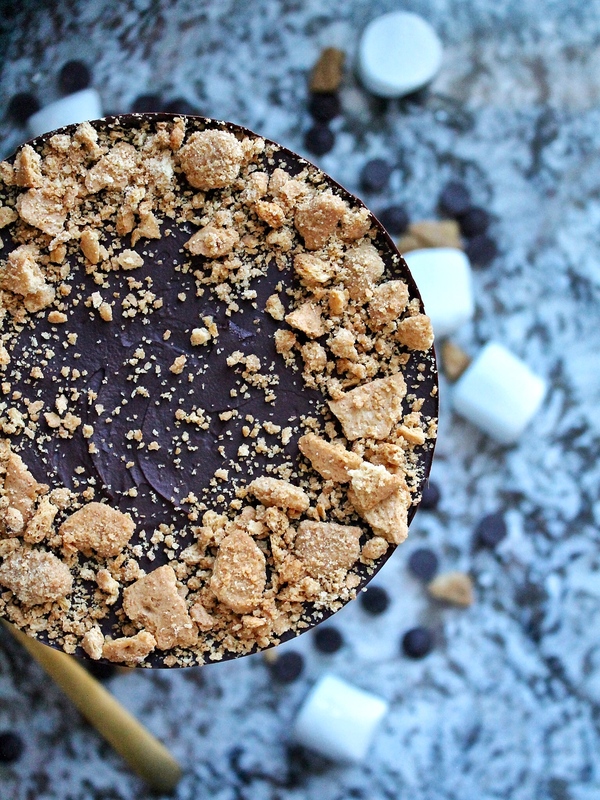 For the third layer, nestle the remaining cake round into the marshmallow filling, cover the top of the cake with the remaining ganache and graham crackers. At least 5 hours before you are ready to serve the cake, pull the sheet pan out of the freezer and, using your fingers and thumbs, pop the cake out of the cake ring. gently peel off the acetate, and transfer the cake to a platter or cake stand. Let it defrost in the fridge for a minimum of 4 hours (wrapped well in plastic, the cake can be refrigerated for up to 5 days). 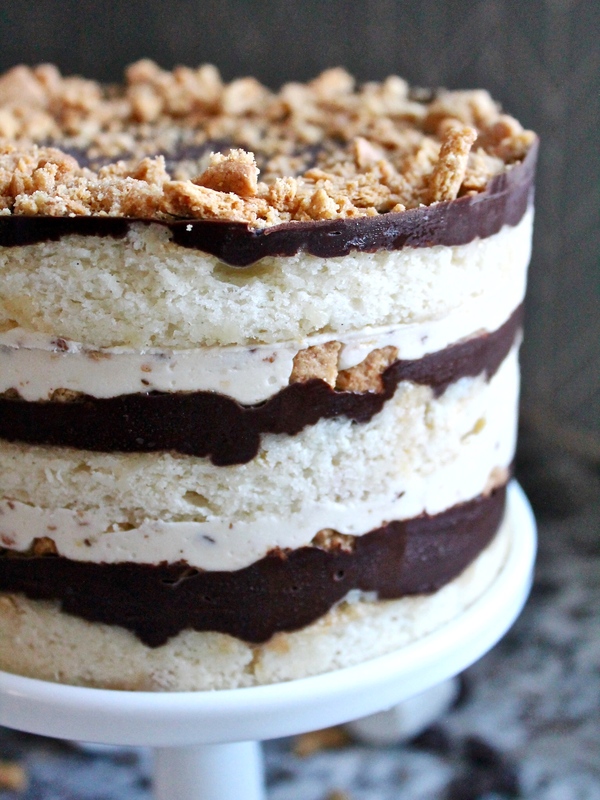 If I don’t have a cake ring, can these cake layers be made in a straight-walled cake pan? You actually need something that doesn’t have a bottom, so you can slip the cake ring or cake form pan off the cake when it’s chilled. You could use a cheesecake pan, and stack the cake inside of it. The cheesecake pan doesn’t do a good job at cutting the cake from the quarter sheet pan, but you can use a knife to do that and just trace the cake pan to make your circles. I used a plastic sugar canister! I outlined the cake and cut the circles out. Then I lined it with Saran Wrap and layered everything in it. It wasn’t perfect, but it worked! As long as it worked and as long as it tasted amazing – that’s all that matters! Hi Courtney! This cake is gorgeous! Have you made the vanilla bean layers in 6″ or 8″ pans before? Just curious as to how many layers it would make. It is similar to a white almond sour cream cake recipe that I use so of course I need to try your version! Yes, you could make this in three 6-inch pans or double the recipe and use three 8-inch pans. Hope you love it! What size cake ring? What brand? And….. how/where do you get the acetate? Can’t wait to make this one!! It’s a 6″ cake ring from Ateco. You can get the ring and the acetate paper on Amazon. Wow! I made this cake today and although there are a lot of steps, it’s actually pretty easy. This is the best white cake base I have ever tasted. I will post pics tomorrow and tag you on my Instagram. This cake looks outta of this world and I bet it tastes even better!!! Excellent work my dear! This looks delicious. One question, what size is the quarter sheet pan you are using? It’s about 8×11″ – half of a normal jelly roll pan.